Today is all about Disney! A few months ago I asked you guys for a little help planning and you came through in a big way. Some of your tips were so helpful, and came in handy for us first timers. Thank you! We had SO. MUCH. FUN. And while at the end of the trip I think we all needed a vacation from our vacation we are so glad we decided to head south to the happiest place on earth for our Winter Break. Here's a little recap of our visit, and I will try to share as many important details along the way. From Atlanta it takes about 8 hours to drive to Orlando. We debated back and forth about flying and driving and somehow Mr. Cute thought driving would be easier. Baby Cute had some other thoughts on that, but the older two were pumped about watching unlimited Disney movies the entire time. Because the road trip ate up most of our first day, it was already dusk by the time we finally arrived at Disney. For the first half of our trip we planned to stay at the Animal Kingdom Lodge. I booked this resort because I knew we were going to Animal Kingdom on our second day and my children LOVE animals. After doing some research on the resort I thought it would be perfect for our stay especially after I read that you are able to see animals from your room. I knew everyone in our crew would be so excited about that experience. We were given a room in Jambo. I had originally requested the bunkbed rooms, but at the last minute changed it to a double queen room because I was nervous the kids would (1) fight over the top bunk or (2) someone would roll off the top bunk in the middle of the night. The room was so cute and definitely spacious enough for our crew. We loved all of the fun African inspired details everywhere! The resort both day and night is gorgeous! And true to promises you are able to see animals right from your room! If you didn't have a room with a savanna view, there were multiple places around the lobby area that you could see the animals. We couldn't believe how close they came. It was raining when we arrived but the next morning we were able to take in the gorgeous pool on site. It also has an amazing waterslide and is heated year round for enjoyment. Tip#1: We learned that almost all pools in Orlando are heated year round. So as long as you are able to stand the temperature when you can out of the pool might as well pack your swimsuit. The kids were beyond excited to finally arrive at Disney (and be out of the car) that they had no desire to pose for any pictures. I can't blame them. I was ready to be out too. I wanted to document their super cute Disney attire though. One of our fabulous readers shared the Gap x Disney collection with me, and I fell in love with the whole line. I ordered a few pieces for this trip but it was a lot warmer than initially we thought it would be. So for the car ride I figured the they could at least a couple things down. After we settled in and explored the hotel a bit, we decided to make our way to dinner. Now here is where my second tip will come in. Tip #2: Make reservations. Make reservations. Make reservations. I thought I could just walk into any property restaurant and our party of five could eat. Wrong. Even at 7p.m. at night there was a 2 hour wait for almost all of the restaurants. The one that didn't have a wait (Jiko) required a reservation anyway, and looked a little nicer than we needed at the moment. There was no way my kids were going to sit for an extended meal after sitting all day in the car. If you have kids who need to eat at certain times I would definitely plan ahead. We ended up eating at the The Mara quick service restaurant, and it was great for what we needed - a quick, easy dinner. 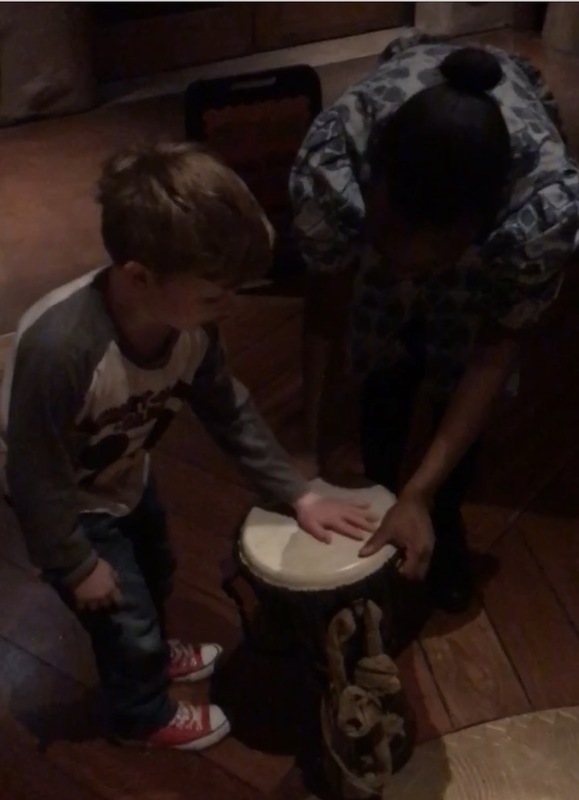 After dinner we stumbled upon one of the fun evening activities where the kids were able to play music on their own little drums. The kids loved this and had so much fun playing and dancing. After this we called it a night knowing we would be having a long day two. Day two we hit the ground running bright and early. The family we were traveling with told us that the animals are most active during the morning and at dusk and that would be the best time to ride on the safari to see them. We took the bus from the resort to Animal Kingdom and it took around 10-15 minutes to arrive at the gate. I thought we were getting there early but I was astonished to see how many people arrived before we did. Not to mention we saw people running to some of the rides once we got in. Running. Clearly I was unprepared for the new age of Disney lines. Enter my next tip. Tip #3: Download the My Disney app. Choose fast passes ahead of time. I wanted to go with the flow on our trip, but I quickly learned that those who don't fast pass don't get the worm. Or the Disney princess. At first it stressed us out to see everyone running around us to try to get first in line for some of the more popular lines. We were instantly thrust into a world of navigating maps, apps, and hoping our phone batteries lasted the entire day (spoiler alert: they didn't). Tip #4: Pack a cordless battery charger. Then our children spotted Flick, their first character, and all worries melted away. They were so in awe and could have cared less about what popular rides were around that they had no clue about. They had so much fun chatting with him, getting him to sign their autograph books, and getting pictures with him that it made us realize that was the "magic" we were looking for. Not stressing about what to do. From then on we took it pretty easy over the next few days. Don't get me wrong, we fast passed but if certain rides weren't available we didn't give them a second thought. Tip #5: Look into the Disney Photo Pass. I added this to our Magic Bands and in the end was so glad that I did. It was a suggestion from one of our friends and it was so nice to interact with our kids and the characters or the rides without having to pull out our phones or cameras to capture the moments. We simply let the cast members take the photos and then swiped our Magic Bands along the way. And there are cast member photographers everywhere! The safari was one of our favorite rides, and even though it was one of the more popular ones, the line moved pretty quickly. We didn't make it onto the ride until about 11:00a.m. or so but those animals must have known we were coming because they were definitely still active. Even as warm as it was, the animals were out and about and several got up close and personal. It was such a neat experience, and one of the few rides we would ride over and over if we could. You really did feel at times you were in the jungle with the animals. We explored, and Cute was able to get on his first official "big person" roller coaster. I thought he would be scared, but he ended up loving it. The nice thing about Animal Kingdom is that everyone (even babies) can right most rides. Some rides I think were 40 inches and up and 44 inches and up. One was 48 inches in Dinoland, but otherwise kids - even younger ones - could enjoy the majority of the park. At some point during the day we made our way to the Tree of Life and went to see the Bugs Life show held inside it. The show is a 3D show and they give you glasses upon entering. The Cutes thought the glasses were hilarious. The show...not so much. I realized later this was my fault. They had never seen a 3D or IMAX style show before and right from the start they were scared. Like full on screaming "GET ME OUT OF HERE!" at the top of their lungs scared. The show was super cute and I think if I had warned them what it was they would have been fine. But there was no recovering from the initial terror of seeing a larger than life spider in your face. I think we might have scarred them for life. Luckily we rallied with our second show. The Lion King show was fabulous and might have been one of my favorite things all week. It was so fun, full of audience interaction, and lots of music and characters from the movie that the kids could identify with. They loved it! At some point towards the end of the day we began our own little food tour. Totally unintentional, but considering my iWatch had been telling me we far exceeded our step goal for the day I wasn't too worried. I kept seeing these yummy Mickey pretzels everywhere, so it was only fitting to give one a try. And then to stumble upon a little area that had fresh fruit (hallelujah! ), water, and some other healthier snacks (minus the chips). After eating fast food for almost two days it was a nice little oasis of yummy to find. And then there were Mickey popsicles and ice cream to be had by all. This is one of the few pics of all five of us together. I am not sure what is funnier...the chaos going on, or the fact that someone stopped and took this precious photo moment for us. After our carb and sugar fest we decided to test out The Boneyard playground to work off some of our Disney Foodie Tour, and O.M.G. First this play area is awesome. Second it is a parents nightmare. Kids were running around everywhere and there were so many little hiding places. I promptly lost two of the two children in my care with in five seconds of walking through the gate (B.C. was still snacking with Mr. Cute) . I panicked slightly, but parked myself near the exit and did my best to look around for glimpses of them. Thankfully, I came home with all the children I started with. And my own children. We were able to get almost everything in that we wanted to see and do. The kids were such troopers and loved every minute of it. As the day wound down we planned to stay at least until the new Rivers of Light show took place. It was beautiful! Our group was split on how they felt about it, but I thought it was a great way to close the day out at the park. Tip #6: If you are staying for the Rivers of Light show be sure to either Fast Pass or get in line super early. We got in line about 40 minutes early and only a few people behind us they closed off entrance. That wraps up our first few days of Winter Break. Stay tuned tomorrow for part two! 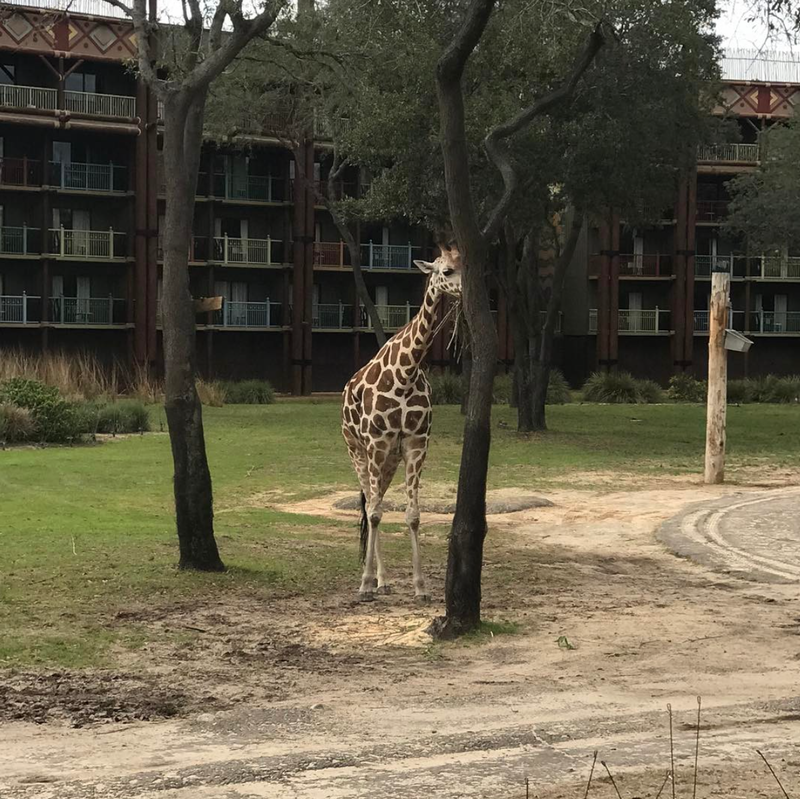 Have you been to Animal Kingdom Lodge or Animal Kingdom? If so, share with us your favorites! We're going the end of April for the first time and your tips are great. We do have my sister with us who is experienced and we used her disney travel rep so we are prepared. I've been hearing about these crowds so we will see. We picked after all spring breakers are done bc we still have preschool aged kids (5 and almost 3). Yay! You're kids are going to LOVE it! Mine are similar and age (6 & 3) and it seemed like it was the perfect time to take them where they are in awe of all the "magic". Good call on post Spring Break! Looking back on it I think it was a busy week with the combination of Presidents Day and the Princess Half Marathon. I've heard otherwise this time of year usually isn't so bad. You'll have to come back and share how it was!